How Can the Portessa™ Portal Builder Help My Company? 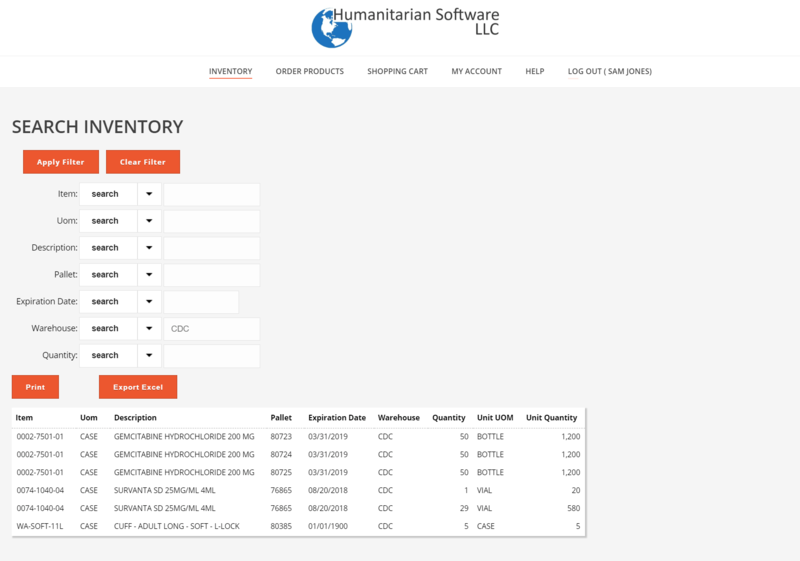 Humanitarian Software LLC has created a number of pre-defined starter templates for typical nonprofit/disaster relief Portals. 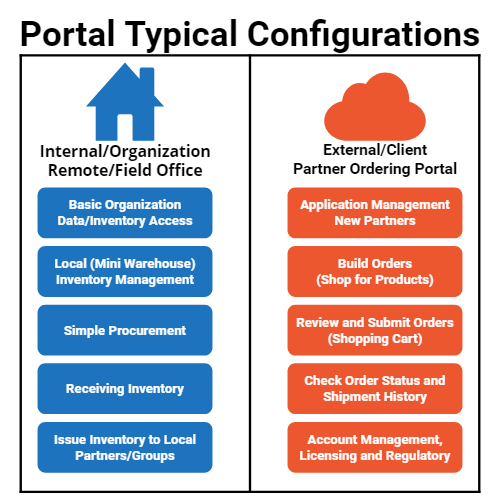 These templates provide a ready to use starting point for your field operations, remote warehouses, and Partner Portals. Additionally, you or the development staff at HS LLC can personalize and expand on these templates to build portals that meet your specific needs and showcase your organizations branding. Typically we see two primary ways in which portals are used to expand the capabilities of our clients. One is to offer simple, easy to use functionality to field offices, emergency response teams, remote warehouses, and other organizational staff out where boots are on the ground. The other, very popular application is for partner portals. These portals offer a number of benefits for both your organization and the Partner. For you, it will offload data entry work such as application entry and processing, product offer distribution and other data entry tasks. 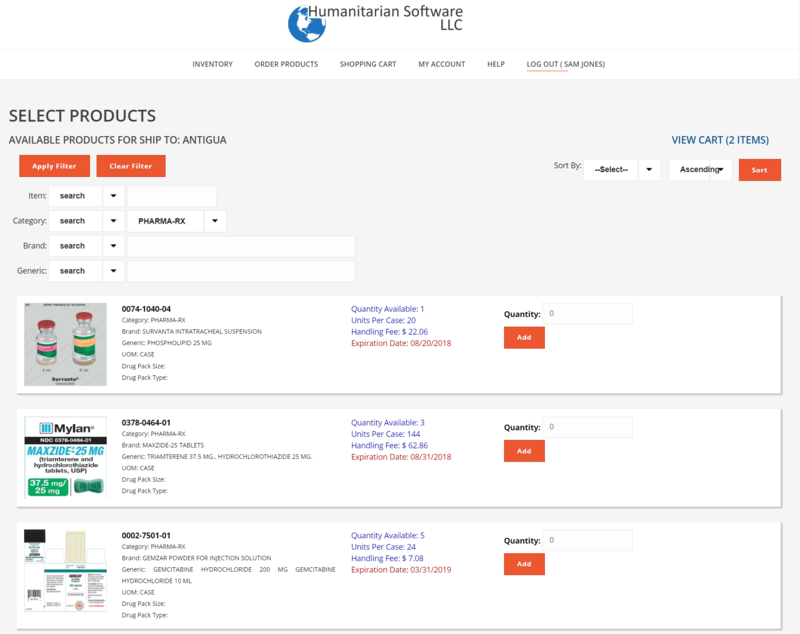 For the Partner it will give 24/7 access to ordering products, tracking shipments and much more. HS LLC utilizes our easy to use, yet secure Portessa™ Portal Builder to design and host these portals. Portessa™ is co-developed with our sister company, Orange Horse Technology, and integrated as part of our product offering. Portals are websites that offer your customers (clients, partners, vendors), or internal employees real-time, 24/7 access to your host systems. This electronic gateway allows authorized users to access records, update accounts, build orders, or do other data sharing operations over the internet via their web browser. While the possible applications are almost limitless, typical applications include online ordering, shipment tracking, customer self-service, technical support, and much more. Client Portals are portals that are focused on giving your customers and clients secure access to their data and operations within your company. The Portessa™ Portal Builder is designed primarily to be a tool to create and power high quality Client Portals. The advantages to offering your clients real-time system access via the web are many. Not only is the time and effort of data entry moved from your staff to the customer, saving labor in your facility, but most customers now prefer to do tasks such as product searches or shopping on the web. 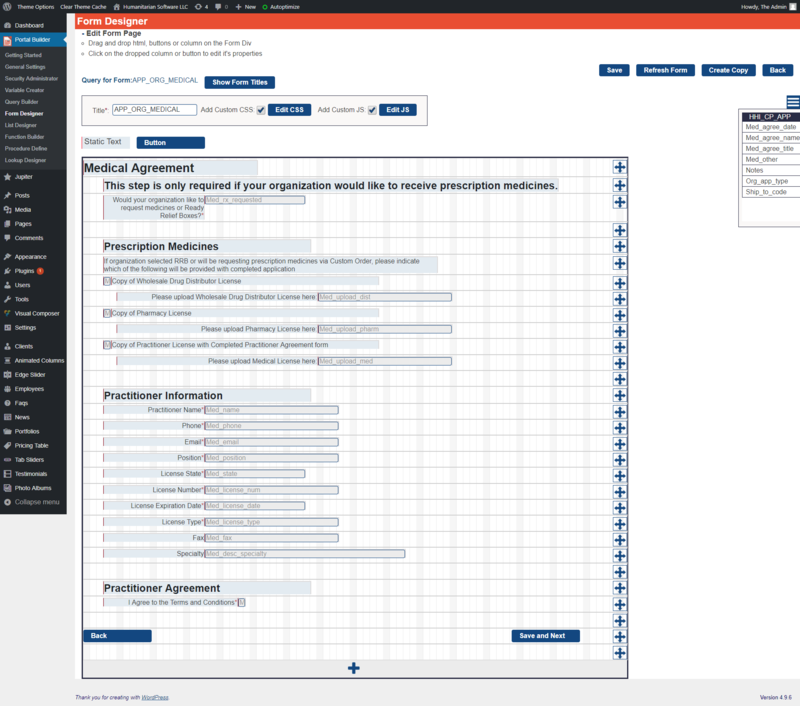 Another primary goal in developing the Portessa™ Portal Builder is to provide a truly generic solution creation tool. Portessa™ Portal Builder is not limited to one type of solution (like say a support desk system), but rather it is designed to support most any type of data embedded website or portal design. The applications that can be created with Portessa™ Portal Builder are virtually unlimited. 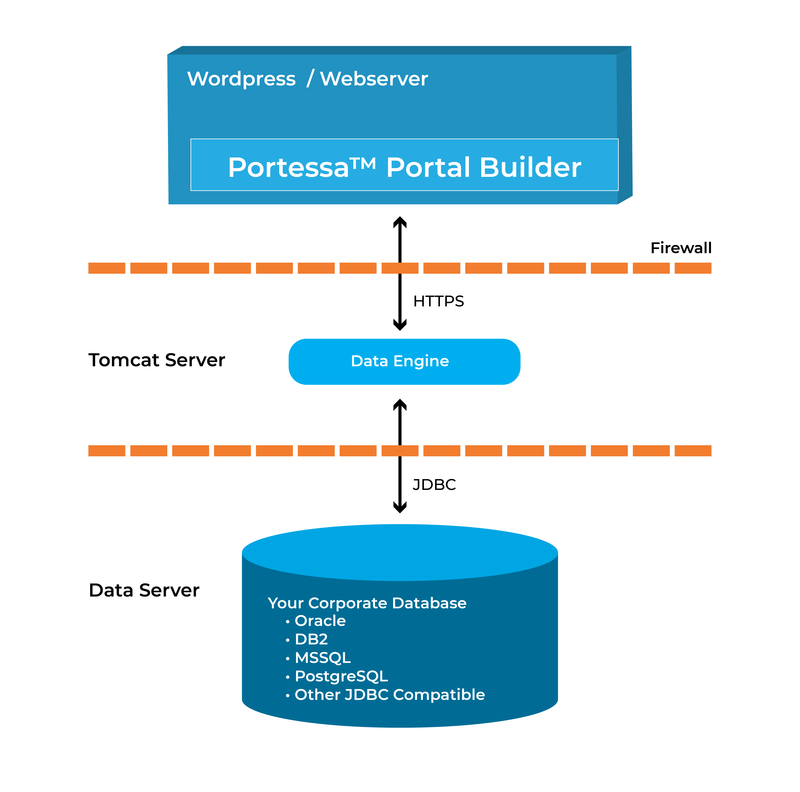 Portessa™ Portal Builder is an integrated website design tool that uses the popular WordPress platform, themes, and design standards to build websites with enterprise level data integration from most backend databases and systems. This set of plugins for WordPress connects to the HELM RESTful Data Engine API on the backend to give full system data integration. This allows for the creation of a client portal that can be used in a variety of different ways to further expand your business’ accessibility, including but not limited to: partners, remote warehouses, field offices and clients. WordPress is reportedly the easiest and most popular website management or blogging system in use on the Web, supporting more than 60 million websites. The immense popularity of the WordPress front end website platform was the primary reason our Portessa™ Portal Builder was designed as a WordPress plugin. The Portessa™ Portal Builder installs and operates using these same popular standards. This allows you to take advantage of countless available themes, templates, plugins, and other options available in the WordPress community and integrate them in your new portal sites. The Portessa™ Portal Builder integrates into your WordPress site in several places, adding several features. The primary design features added are focused into two distinct areas: Form building and Free-form design. The Form Builder plugin is one component of Portessa™ Portal Builder. The Form Builder is designed to create a full, data rich form that is tied to a single shortcode that can be dropped in any page. In Form Builder you create a new form, select one or more data tables to link in, and save it as a template shortcode. Then you can drag and drop data fields, HTML blocks, and action buttons and place then anywhere on the form in a self-aligning, responsive grid. You can select or define detailed properties on any element dropped on the page. Finally you can choose allowed functions for the form, like read-only, edit, insert, etc. The Free-form plugin is another component of Portessa™ Portal Builder. This powerful tool is designed for more advanced users who want more control over placement and use of data elements in their page designs. In the Free-form Builder, similar to Form Builder, you start by creating a new form and select one or more data tables to link in. Once this basic connectivity form is created, now any data linked to the results can be placed free-form as shortcodes in your page design. For more advanced users, programmers can access the RESTful Data Engine API directly. This provides a secure way to access and integrate data into an array of popular web development tools and programming languages. The front end component of Portessa™ Portal Builder is a WordPress plugin which adds tools to design forms or free-form pages with integrated data elements. The form page builder gives you the ability to link one or more data tables, design forms that support displaying, editing, validation, and inserting of data to your host system. The free-form page builder gives the ability to access data elements from your tables in individual shortcodes that can be placed anywhere on your pages. More advanced features include the ability to add actions and buttons to recall, save, insert data, as well as call host API functions, make SQL queries, and call stored procedures. The back end component of the Portessa™ Portal Builder is our RESTful Data Engine API. This Java based application runs in an independent location and serves as the engine that services secure https REST formatted requests from the Portessa™ Portal Builder (or your custom code). This engine processes the requests and communicates not only with HELM, but also with any JDBC compatible database (such as Oracle, Microsoft SQL, DB2, MySQL, PostgreSQL, and others) to select, insert, update, or delete data. The engine also has API functions to call stored procedures or other database objects in your host system to perform various tasks. The Portessa™ Portal Builder combines the popular and easy to use WordPress front end with enterprise level secure backend data access. This powerful combination allows organizations to build secure, reliable, and effective portals with a minimal knowledge of web development. Under the hood of the Portessa™ Portal Builder is our powerful RESTful Data Engine API. This Data Engine provides a secure and reliable connection to your data in a number of ways. First, the Data Engine provides separation between your website and your database. All data requests from the website are sent as encrypted https requests to the Data Engine. Your website has no direct connection to the database. The second area of security lays within the controlled access to the database, which is configured in the Data Engine, not the website. The RESTful Data Engine API is installed independently of your WordPress website. The Data Engine can reside on a different server from the website, and from the database(s) it is working with. This allows for a variety of firewall and DMZ options to further clamp down on data security. The Data Engine can maintain multiple connections to multiple databases of different types simultaneously. For the administrator, the Data Engine configuration is a control gateway to database and object access. Access to tables, view, procedures, and other objects is granted in the Data Engine configuration. The front end designer using the tools in WordPress only see the objects you give permission to. The website itself has no direct access or login to your database.